Bansil (as he was known) was a Photogrammetic Instrument Operator at Faireys for many years He was a senior operator by the time I trained to work in that department in 1973. He remained on the staff until Christmas 1983 when the company, by then owned by Halcrow, made around half of the operators redundant. Some years later, and after the ESL takeover, he returned to work at the office in Reform Road but eventually was made redundant again and spent the remainder of his working life at a mapping company based in Worcester. Bansil was a skilled and careful worker who was well respected by his colleagues. I am sure our thoughts will be with his family at this difficult time. 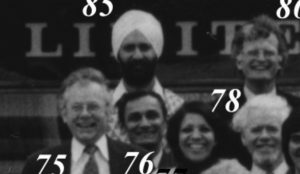 Bansil is in the group photograph taken outside the Reform Road office in about 1979. He is number 85, in the top row – clip below, with Peter Timbrell, Tony Dady, R. Pandia, Fari Limoiee and Ken Pinkney, among others. The full group photograph is in the History section of the website.